There is virtually no question you can ask that cannot be answered by a video clip or presentation. The “search” tab at YouTube is the Library of Congress for information in video form. Investors have discovered that they can find out answers to their questions about investment issues or financial products on the internet, and many of them prefer to have their answers presented to them in a video format. The investors for whom investing is a daily pursuit and active interest watch financial videos. If there are videos available on the website of their financial provider or advisor, they will watch that as well. In fact, many investors prefer to go to their advisor’s website to find applicable videos. That begs the question: Advisors, do you have the videos your clients want to watch? If you do, they will watch them - on your website. And investors want them. 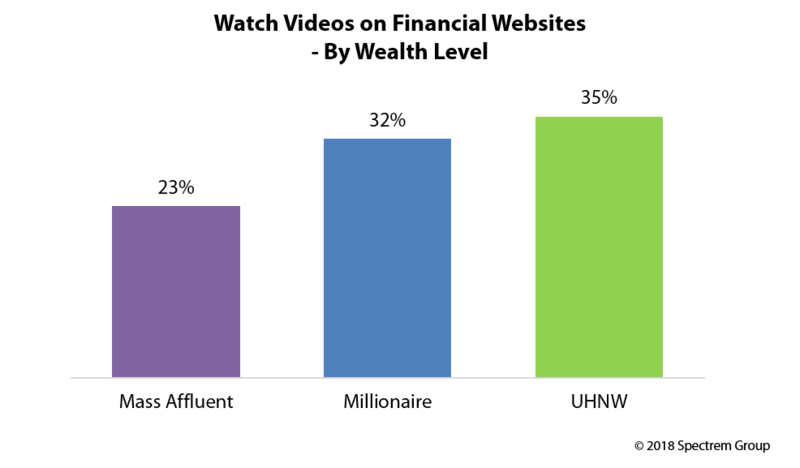 According to Spectrem’s quarterly wealth segmentation series study Using Social Media and Mobile Technology in Financial Decisions, 29 percent of all investors watch videos on financial websites, and that includes 42 percent of Millennials and 34 percent of Gen X investors, who are likely at the height of their need for financial information. These are not just Millennial investors watching, either. Among the 25 percent of World War II investors who watch financial videos, half of them watch education videos or videos by financial commentators, and 61 percent watch videos on current financial events. Videos on current events are the most popular financial videos, attracting 59 percent of all investors who watch videos. Educational videos attract 54 percent of that crowd, and 64 percent of Gen Xers. Investors prefer videos on websites of trusted financial authorities rather than just chasing a topic on YouTube. Fifty-two percent say they want to watch videos on their advisor’s website while only 15 percent want to do so on YouTube. The value of presenting and maintaining a video presence on your firm’s website is significant and growing. Videos can present a call to action that could engage and encourage an investor to place a call to his or her advisor for more information or to take action.